Our courteous, insured, and professionally trained air duct cleaning company uses the process that follows National Air Duct Cleaners Association guidelines. We thoroughly pre-inspect your home's air duct system before any work is done. 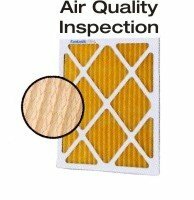 We inform you of exactly what work we will do as part of the air duct cleaning service. Additionally, our indoor air quality specialists install whole-house air cleaners and humidifiers for your home in Harrison. If you are looking for reliable service from a reputable Harrison duct cleaning company, please contact us today. One of our staff will be happy to answer your questions or schedule service. When ductwork becomes clogged, the machinery will have to work harder in order to force the air through. This means that it is much more likely that machinery parts may begin to fail. The homeowner may have to replace parts like igniters, thermostats, or even motors far earlier than he would have if he had gotten regular air duct cleanings. NuAir Solutions installs a number of superior air cleaners for your Harrison home. Our air cleaners come from reliable manufacturers such as Aprilaire, Nature's Home, and OxyQuantum LED U.V. Cleanser. Each offers you specific performance to clean and purify the air in your home automatically. Most homes in Harrison need a whole-house humidifier to help put moisture back in the air that the furnace takes away. If you've been suffering from sinus infections or breathing problems, it could be a simple fix to improve your health. Call us today to go over the whole-house humidifiers we install. Our duct cleaning company can also help you install a dehumidifier if you need it. If you are looking for a duct cleaning company in Harrison then please call 914-381-5764 or complete our online request form.